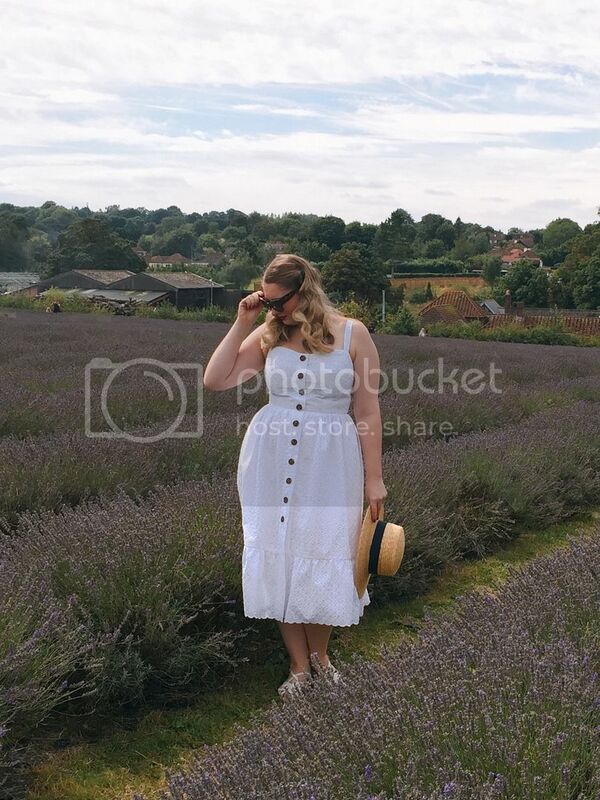 I have wanted to visit a lavender field for the longest time, so when an opportunity presented itself I knew I needed to make a dress to wear. I wanted something with a whimsical feel but a simple shape because it was a very last minute make and I didn't have a dress pattern to work from. The fabric is a cotton Broidery Anglaise which I had in stash. I don't usually like to keep fabric in stash because I find I tend to go off them if they don't get made into something while I am still excited about it. I had got to the point where I had forgotten what I had bought this fabric for and I was irritated that it was taking up space in my very limited storage. It is such a beautiful fabric though, and I didn't want it to go to waste. I used a classic men's coat buttons in brown down the front. They have an almost tortoise shell effect that I rather like, and compliments my new Joanie sunglasses that I picked up in their sale last week. 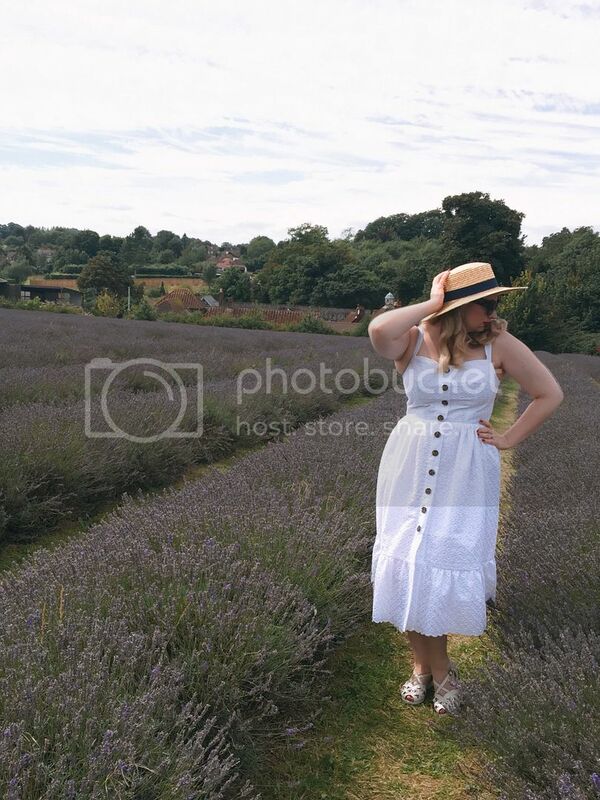 I naturally had to team this dress with my favourite straw hat for a stroll about the lavender field! At first I cut the neckline totally straight, but I went back in mid sew and slightly curved it into a slight sweetheart shape, which I much prefer. It is still only a very subtle change but I do think it looks softer. The hem ruffle is possibly my favourite element of the dress! I allowed the scalloped edge to border the bottom hem and the result is such a sweet little detail. I am so happy with the result, and the white fabric photographed much better than I had thought it would! It's always such a shame when the beauty of something just doesn't translate well in a picture. 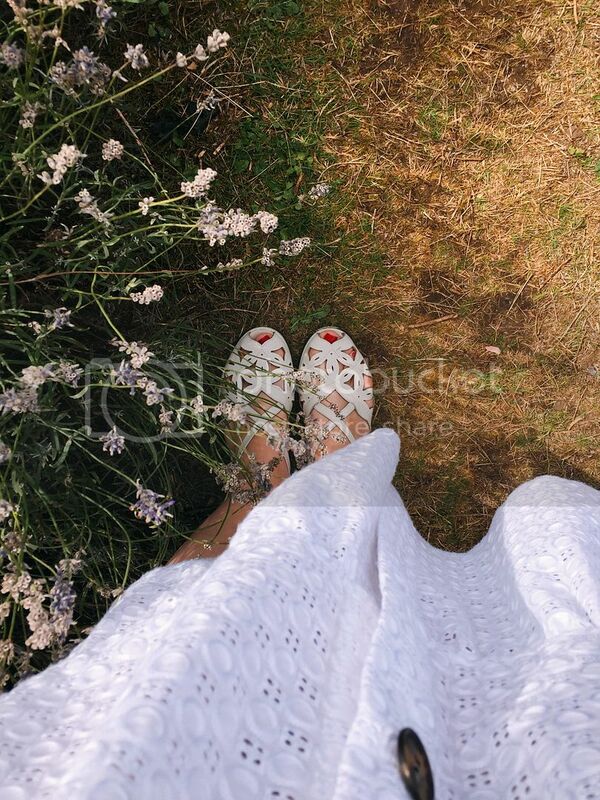 My new favourite shoes from Rocket Originals are absolutely darling and go with practically everything! I would most definitely recommend the brand to anyone that has been on the fence about purchasing from them online. The lavender was magnificent, and the smell was intoxicating! I could smell it in the air as soon as I got off the bus. 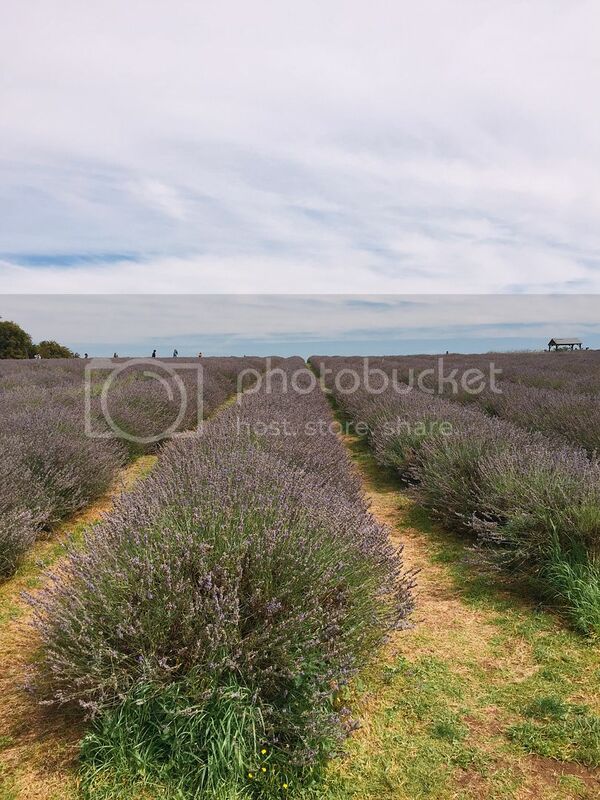 The Mayfield lavender field was a lovely little afternoon trip, it is always so refreshing to take a step away from the usual, everyday routine to see something special. And a special thank you to my lovely friend Maria who took an afternoon jaunt to the countryside and who took such lovely pictures for me. 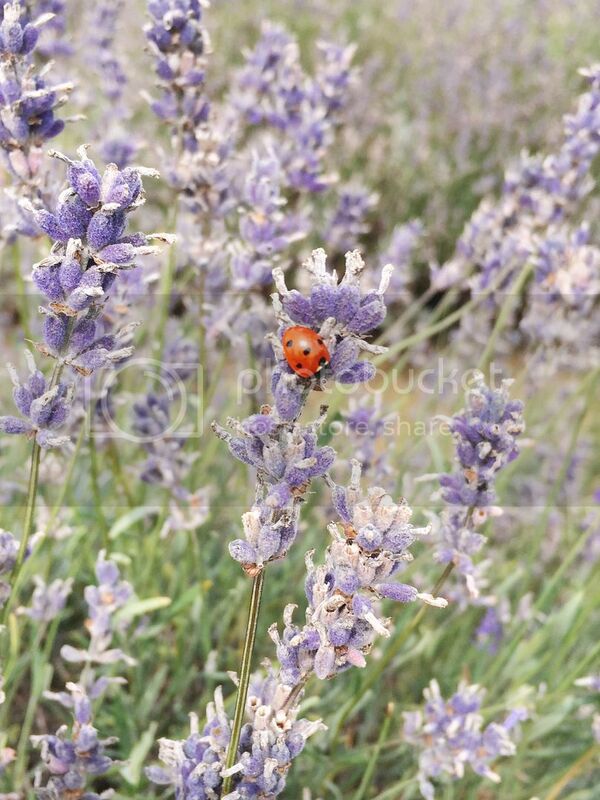 Beautiful photos - I'm yet to find a lavender field near me, so colour me green with envy! Broderie anglaise was a perfect choice and this is another perfect dress! You make me want to learn to sew so much... until I remember I have no patience or skill for it. 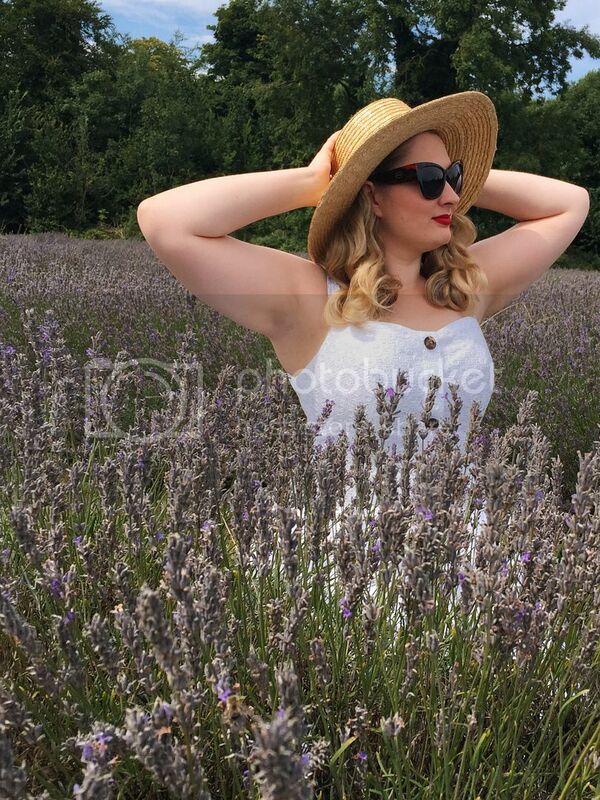 Wow, I'd never thought of going to a lavender field but these photos make me want to go. I've just done a search online and there's one near me. Yay! It's closed now until next year but I will definitely keep it in mind. The dress looks fab, I love broderie anglaise, it's just so fresh! The ruffle at the bottom is the perfect touch and using the scalloped edge really makes it look beautifully finished. What a lovely dress! 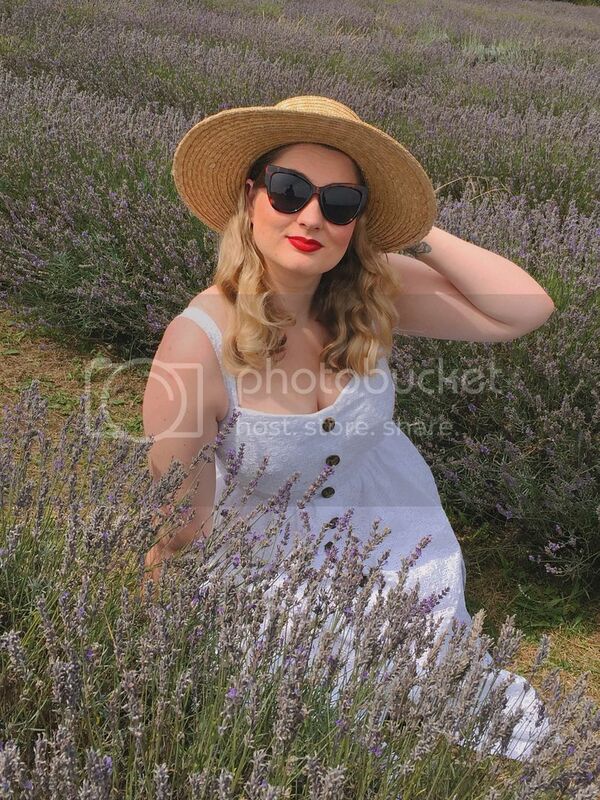 It's perfect for summer, especially if your summer involves frolicking in a lavender field. The broderie anglaise is such a gorgeous fabric, and this dress is exactly the sort of thing that works so well with it. Love that little ladybug! What a stunning backdrop for this whimsical dress! 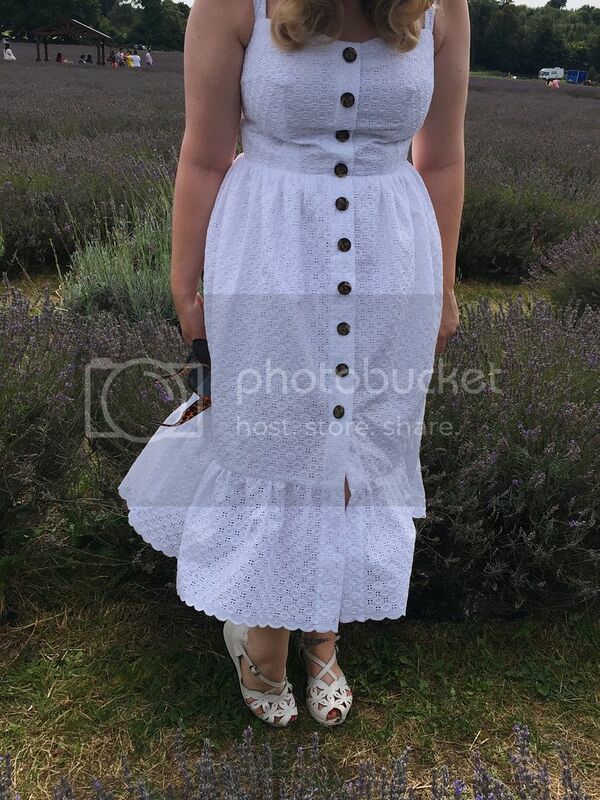 White dresses are just the thing to wear in a lavender field and broderie anglais was the perfect choice of fabric as it suits the daintiness of the dress with all its ruffles so well. The contrasting buttons were a great idea, I love that you wore sunglasses to match them! I've been eyeing that particular pair of Rocket Originals sandals for a while and now I want them even more, all of their styles are so lovely. 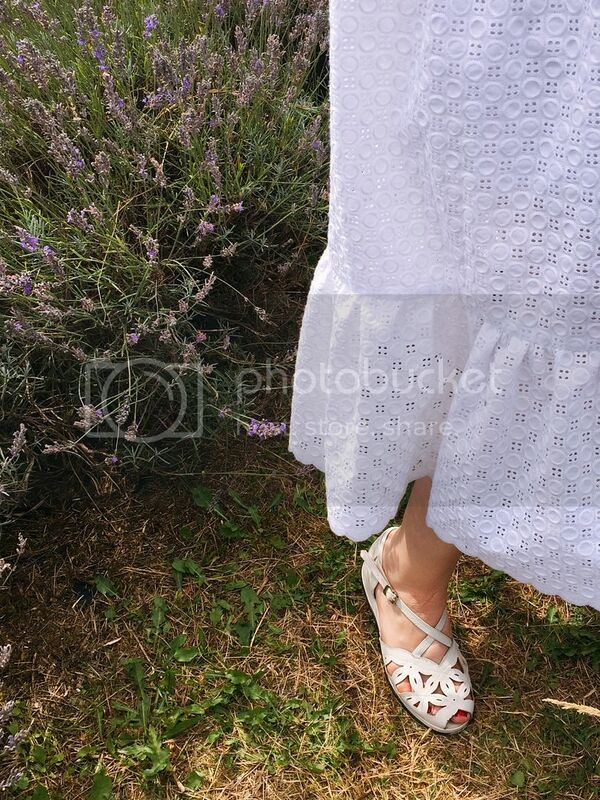 Such a pretty dress, it looks so fresh and summery. 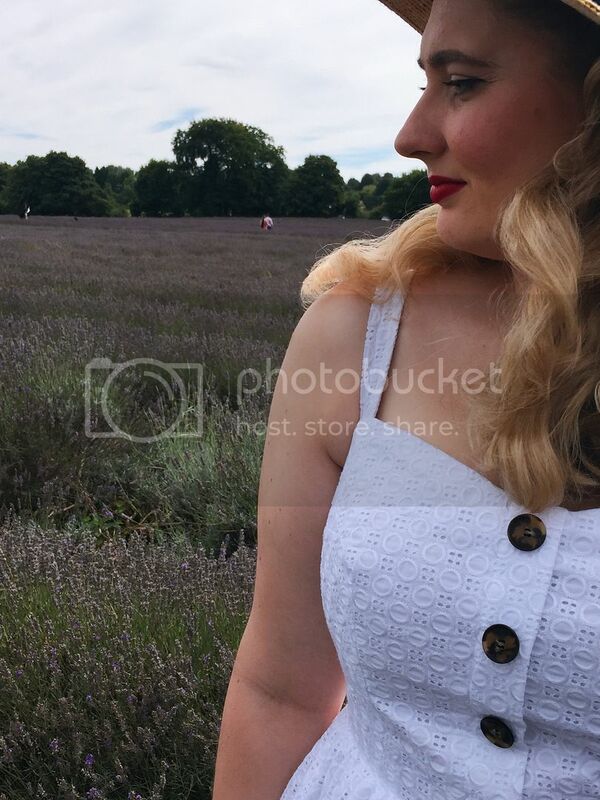 The lavender field makes a lovely backdrop. 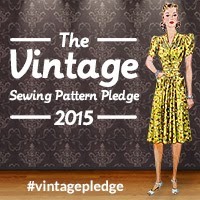 I am proud to invite you into my tiny box room in London where I sew and craft anything vintage. Grab yourself a cup of tea, a slice of cake, make yourself at home and enjoy your stay.